ST. LOUIS, Mo. 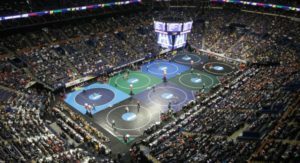 – After the first day of action at the NCAA Championships, Mizzou Wrestling sits in fifth place with 20 team points. Five Tigers punched their tickets into Friday’s quarterfinals at the Scottrade Center, including senior 197-pounder J’den Cox (Columbia, Mo.) and redshirt junior 157-pounder Joey Lavallee (Reno, Nev.), who each recorded their second bonus point win of the day. The Tigers will begin the second day of competition in fifth place, trailing only Penn State (30.5 points), Ohio State (26 points), Oklahoma State (25.5 points) and Iowa (24.5 points) in the race for a team trophy. Joining Cox and Lavallee in the quarterfinals will be redshirt freshman 141-pounder Jaydin Eierman (Columbia, Mo. ), redshirt senior 149-pounder Lavion Mayes (Mascoutah, Ill.) and redshirt sophomore 165-pounder Daniel Lewis (Blue Springs, Mo. ).